Many people all over the world are waiting for the release date of Star Wars: Episode VII movie. What if we tell you that you can not only watch this film, but even take part in its creation? 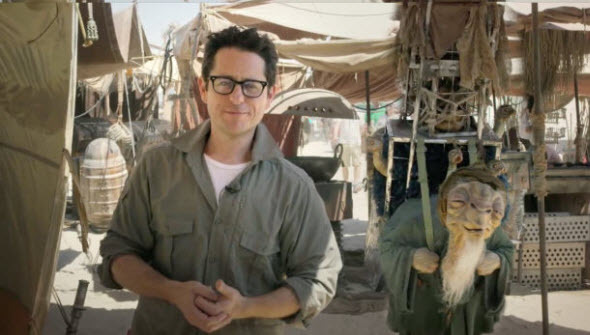 A few hours ago, J.J. Abrams posted behind-the-scenes video, in which invited fans to join him in the shooting area. At first, we would like to draw your attention to the fact that the first official video of Star Wars: Episode VII movie has finally appeared in the network. Although no footage of the upcoming blockbuster has been included in this short commercial, we still can notice several pretty exciting details. Thus, we can see the shooting area that is situated in Abu Dhabi and a funny and weird character. We have no idea, who he is, but suggest you watching the freshest video and telling us about your guesses in the comments below. And now the most exciting part. As you may already have understood from the video, J.J. Abrams asks the fans of Star Wars to take part in the charity campaign and contribute at least $10 for UNICEF - international children's fund. All participants have a chance to win the main prize - take part in the shooting of Star Wars: Episode VII movie! Organizers are promising to bring you to London, allow meeting the cast of the film and even give you an opportunity to appear in some small episode of the upcoming blockbuster. Those who will contribute more than $10 will be able to get lots of pleasant bonuses - Star Wars themed T-shirts, posters, figurines and whatnot. The full details are available on Omaze.com. Do you want to join the cast of Star Wars: Episode VII movie? Are you waiting for its release date? Your comments can be left at the bottom of the page.